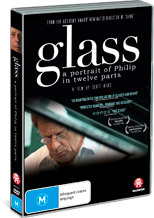 Philip Glass is a true music genius and this documentary takes the viewer into the life of this most remarkable man. The music of Glass has been embraced by musicians, directors and other entertainment facets of the world and through interviews with colleagues, friends and other artists, this documentary pieces together the puzzle of Philip Glass. Of course, it also gives us a unique insight into what makes him tick. His passion for music is truly quite riveting as is his passion for life, especially from a man in his 70’s who should be slowing down. However Glass continues to work and ensures that each piece that he rights is his best at the time. Glass: A Portrait of Philip in Twelve Parts is directed by Scott Hicks who happens to highlight the weaknesses and flaws of this amazing musician such as the relationship with his considerably younger wife and his perfectionist approach to everything he does. The whole experience of this series is quite surreal, almost hypnotic with a touch of bipolar added for spice which includes happiness and depression, as is the music of the master, Philip Glass. A very gripping documentary!